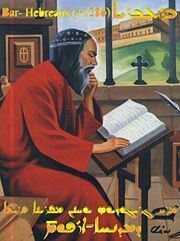 Bar-Hebraeus (1226 - July 30, 1286) was catholicos (bishop) of the Syriac Orthodox Church in the thirteenth century. He is noted for his works addressing philosophy, poetry, language, history, and theology. Bar-Hebraeus was born with the Arabic name Abū'l-Faraj bin Hārūn al-Malaṭī. It appears that he took the Christian name Gregory Grigorios at his consecration as a bishop. Throughout his life, he was often referred to by the Syriac nickname Bar-‘Ebrāyā, which is pronounced and often transliterated as Bar-‘Ebroyo in the West Syriac dialect of the Syriac Orthodox Church), giving rise to the latinized name Bar-Hebraeus. This nickname is often thought to imply a Jewish background (taken to mean "Son of the Hebrew"). However, the evidence for this once popular view is slim. It is more likely that the name refers to the place of his birth, ‘Ebrā, where the old road east of Malatya towards Kharput (modern Elazığ) and Amid (modern Diyarbakır) crossed the Euphrates. His numerous and elaborate treatises on theology, philosophy, science and history represent compendia of the state of learning in these fields at the time. Most of his works were written in Syriac, but some in Arabic, which had long before his time supplanted Syriac as a living speech. His writing is a valuable source of information not only about the history of the region but also about ecumenical and Interfaith relations, especially Christian-Muslim relations. When his writing became known in Europe, it contributed significantly to the development of the academic study of Islam and of the Arab world making the task of writing a history of the Arabs as academically respectable as writing the history of the rise and fall of the Romans. His respect for Muslim learning meant that he saw Muslims as occupying the same, not a different world from himself. In a world where cultural and religious difference has too often been used as an excuse to ridicule others, to discriminate against them and even to attack other's or their territory, examples of more harmonious coexistence are important. Without harmony, the unified world of peace that many people want to build will remain an unrealized dream. A Jacobite Syrian bishop, philosopher, poet, grammarian, physician, biblical commentator, historian, and theologian, Bar-Hebraues was the son of a physician, Aaron Hārūn bin Tūmā al-Malaṭī. A few Syriac sources give Bar-Hebraeus's full Arabic name as Jamāluddīn Abū'l-Faraj Ġrīġūriyūs bin Tājuddīn Hārūn bin Tūmā al-Malaṭī. However, all references to this longer name are posthumous. The Syriac nickname Bar-‘Ebrāyā is sometimes Arabized as Ibn al-‘Ibrī. Sometimes, Bar-Hebraeus is said to have been given the baptismal name John, but this appears to be a scribal error. As a Syriac bishop, Bar-Hebraeus is often given the honorific Mār, pronounced Mor in West Syriac dialect), and thus Mar/Mor Gregory. Under the care of his father he began as a boy (a teneris unguiculis) the study of medicine and of many other branches of knowledge, which he pursued as a youth at Antioch and Tripoli, Lebanon, and which he never abandoned. He says in his Historia synastiarum that he studied medicine under a distinguished Muslim physician in Damascus.. In 1246, he was consecrated bishop of Gubos, by the Jacobite Patriarch Ignatius II, and in the following year was transferred to the see of Lacabene. He would have taken monastic vows before his consecration, probably "while he was in Antioch," He was placed over the diocese of Aleppo by Dionysius, Metropolitan of Melitene (1252). He was ousted from this position in 1255 due to an internal feud following the Patriarch's death between Dionysius and a rival contender for the Patriarchate, John. After returning to Aleppo where he stayed at his father's house, he was re-instated in 1258. Takahashi says that between 1260 and 1263, Bar-Hebraeus spent a lot of time at the Moghul court, where he served as physician to Hulagu Khan. In 1264, he was made primate, or maphrian, of the East by Ignatius III. During the years 1264 until his death, he was based in the Monastery of Mar Mattai in Mosul, although he also traveled lecturing and exercising Episcopal oversight. In 1277, he visited Tikrit, the first visit by the maphrian in 60 years. His Episcopal duties did not interfere with his studies; he took advantage the need to travel throughout his vast province to consult libraries and to meet with scholars. He was, though, a conscientious pastor, building and repairing churches, visiting some of the most difficult areas of his province and consecrating twelve bishops. He found many valuable sources in the Library at Maragha, where he enjoyed a "good relation with the Muslim scholars." He became familiar with almost all branches of secular and religious knowledge, and in many cases thoroughly mastered the bibliography of the various subjects which he studied. How he could have devoted so much time to such a systematic study, in spite of all the Mongol invasion which took place at this time, is almost beyond comprehension. Bar-Hebræus' main contribution to historical scholarship lies less in his original writing than in his work of preserving and systematizing the writings of his predecessors, either by way of summary or of direct reproduction. He acquired fluency in a number of languages, including Armenian, Persian at least "in the latter part of his life" and possibly Mongolian. Whether he knew Greek or Hebrew is uncertain. A total of 31 works are attributed to his authorship. These cover theology, history, medicine and liturgy. Bar-Hebræus' scholarly reputation earned him wide respect, and his death in 1286 was mourned not only by men of his own Church, but also by the Nestorians and the Armenians. Bar-Hebraeus appears to have enjoyed good fraternal relations with the Nestorians in particular. In some of his theological writing, he made what has been described as "ecumenical gestures" towards other Christians. He may have realized that Christians under Muslim rule gained nothing from disunity. Nestorians, too, occupied high position under the Mongol rulers and so good relations with them was pragmatic. However, Takahashi thinks that his ecumenism was also quite sincere. Takahashi says that he is the only "Syrian Orthodox historian to have concerned himself in any detail with the history of the Church of the East." In his writing he advised that disputations about the persons and natures of Jesus Christ should be set aside, while the doctrines of the Nicene Creed should be accepted. The Nestorian Catholicos also spent much of his time at Maragha. However, when Bar Hebraeus started to use the title "Cathoklicos" himself in 1265 when he visited Baghdad he appears to have offended the Nestorian, or East Syrian Catholicos. The cities of Antioch and Tripoli, where Bar-Hebraeus spent some of his childhood, were Crusader states at the time, so he had some contact with Latin Christians. However, he does not appear to have been influenced by Latin scholarship. The Muslims are far from being in darkness, in as much as they have rejected the worship of idols and worship only one God. But they still lack the perfectly pure light … because of the incomplete knowledge which they have of our Christian faith and our orthodox confession." Bennett describes this view of Islam as "a partial affirmation and a partial denial" of Muhammad's "claims to be an apostle of a God-given faith." It probably, he says, reflected "the political reality" that "being a Christian in the Muslim world was not altogether unpleasant" which may have been especially true for Syrian and Nestorian Christians for who m Byzantine rule was actually less pleasant. When he wrote of Muslim culture, Bar-Hebraues expresses what can best be described as admiration. He draws here on his own interaction with Muslims, "There arose among them philosophers and mathematicians and physicians, excelling all the ancient sages … Their architecture was great by reason of consummate style and skillful research," for example, "but their law was cumbersome." Even when he complained about the persecution of Christians, he did so "boldly and freely and without giving the impression that he felt" himself "in jeopardy for doing so." When Pococke took a copy of Bar-Hebraeus' Chronicle back to England, on the one hand this helped to perpetuate some traditional Christian criticisms of Islam. On the other hand, his historically accurate description of Islam's origins "added considerably to what European knew about Muhammad" and Islam. Bennett comments that despite some negativity, Bar-Hebraeus saw himself as occupying "the same, not a different world, from his Muslim neighbors and colleagues." This meant that he and they also occupied the same intellectual world, which was a world of reason and reason could be the basis of interaction between Christians and Muslims. He fell ill at Maragha in 1286 and died there. He was buried at the convent of Mar Matthew, near Mosul. He has left us an autobiography. His great encyclopedic work is his Hewath Hekhmetha, "The Cream of Science," which deals with almost every branch of human knowledge, and comprises the whole Aristotelian discipline, after Avicenna and other Arabian writers. This work, so far, has not been published, with the exception of one chapter, by Margoliouth, in Analecta Orientalia ad poeticam Aristoteleam. The rest is to be found only in MSS., preserved at Florence, Oxford, London, and elsewhere. Teghrath Teghratha, "Commerce of Commerces," a résumé of the preceding, also unpublished. Kethabha dhe-Bhabhatha, "Book of the Pupils of the Eyes;" compendium of logic and dialectics. Kethabha dhe-Sewadh Sophia, "Book of Speech of Wisdom;" compendium of physics and metaphysics. he also wrote a few translations of Arabic works into Syriac, as well as some treatises written directly in Arabic. The most important work of Bar Hebræus is Aucar Raze, "Storehouse of Secrets," a commentary on the entire Bible, both doctrinal and critical. Before giving his doctrinal exposition of a passage, he first considers its critical state. Although he uses the Peshitta as a basis, he knows that it is not perfect, and therefore controls it by the Hebrew, the Septuagint, the Greek versions of Symmachus, Theodotion, Aquilla, by Oriental versions, Armenian and Coptic, and finally by the other Syriac translations, Heraclean, Philoxenian, and especially Syro-Hexapla. The work of Bar Hebræus is of prime importance for the recovery of these versions and more specially for the Hexapla of Origen, of which the Syro-Hexapla is a translation by Paul of Tella. His exegetical and doctrinal portions are taken from the Greek Fathers and previous Syrian Jacobite theologians. No complete edition of the work has yet been issued, but many individual books have been published at different times. Bar Hebræus has left a large historical work called Makhtbhanuth Zabhne, "Chronicon," in which he considers history from the Creation down to his own day. It is divided into two portions: The first deals with political and civil history and is known as the "Chronicon Syriacum;" the second, "Chronicon Ecclesiasticum," comprising the religious history, begins with Aaron and treats in a first section of the history of the Western Syrian Church and the Patriarchs of Antioch, while a second section is devoted to the Eastern Church, the Nestorian Patriarchs, and the Jacobite Maphrians. Edward Pococke, Oxford University's first Professor of Arabic took a copy of this text back to England with him after his stay in Aleppo where he served as Chaplain to the English community. Bar Hebræus utilized almost all that had been written before him. The best edition of the "Chronicon Syriacum" is that of Bedjan, "Gregorii Barhebræi Chronicon Syriacum" (Paris, 1890). The best edition of the "Chronicon Ecclesiasticum" is that of Abbeloos and Lamy. The "Chronicon Syriacum" was rendered into Arabic by Bar Hebræus himself under the name of "History of Dynasties;" the latest and the best edition of his work is that of Salhani. In theology Bar Hebræus was a Miaphysite. He probably, however, thought that the differences between Catholics, Nestorians, and the rest were of a theological, but not of a dogmatical nature, and that they did not affect the common faith; hence, he did not consider others as heretics, and was not himself considered as such, at least by the Nestorians and the Armenians. In this field, we have from him Menarath Qudhshe, "Lamp of the Sanctuary," and the Kethabha dhe-Zalge, "Book of Rays," a summary of the first. These works have not been published, and exist in manuscript in Paris, Berlin, London, Oxford, and Rome. Ascetical and moral theology were also treated by Bar Hebræus, and we have from him Kethabha dhe-Ithiqon, "Book of Ethics," and Kethabha dhe-Yauna, "Book of the Dove," an ascetical guide. Both have been edited by Bedjan in "Ethicon seu Moralia Gregorii Barhebræi" (Paris and Leipzig, 1898). The "Book of the Dove" was issued simultaneously by Cardahi (Rome, 1898). Bar Hebræus codified the juridical texts of the Jacobites, in a collection called Kethabha dhe-Hudhaye, "Book of Directions," edited by Bedjan, "Barhebræi Nomocanon" (Paris, 1898). A Latin translation is to be found in Angelo Mai, "Scriptorum Veter. Nova Collectio," vol. x. Bar Hebræus has left besides many other works. On grammatical subjects we have the "Book of Splendours" and "Book of the Spark," both edited by Martin, "Oeuvres grammaticales de Aboul Faradj dit Barhebræus" (2 vols., Paris, 1872); also works on mathematics, astronomy, cosmography, and medicine, some of which have been published, but others exist only in manuscript. Kethabha dhe-Thunnaye Mighaizjzikhanl (Book of Entertaining Stories), edited and translated by E. A. Wallis Budge. Bar-Hebraeus' writing represents an invaluable compendia of knowledge across the humanities and sciences at the time, and is especially significant in making available historical data. His approach to Islam was also significant, sharing features with his European contemporary, Aquinas (1223-74), who also drew on Muslim sources and regarded Muslims, Jews and Christians as occupying the same intellectual space. He has been called "one of the most learned and versatile men that Syria ever produced." Only when people see the cultural and religious "Other" as equally human and worthy of respect, can the tendency to demonize them be overcome. In a world where cultural and religious difference has too often been used as an excuse to oppress Others, even to conquer their territory, examples of more harmonious coexistence are important. Without harmony, the unified world of peace that many people want to build will remain an unrealized dream. ↑ Takahashi (2005), 52, 103. ↑ 17.0 17.1 Bennett (1998), 73. ↑ Joseph Assemani, Bibliotheca Orientalis, Rome, II, 248-263. ↑ D.S. Margoliouth, Analecta orientalia ad Poeticam Aristoteleam (London, UK: D. Nutt, 2002, ISBN 9783487111322), 114-139. ↑ Bar Hebraeus, Jean Baptiste Abbeloos, and Thomas Joseph Lamy (1872). ↑ Bar Hebraeus and Anṫūn Ṡāliḣānī, Tarikh ed-Duwal (Histoire des dynasties) (Beyreuth, DE: Catholic Press, 1890). ↑ William Wright, in Norman McClean, "Bar-Hebraeus," Encyclopaedia Britannica (Cambridge, UK: Cambridge University Press, 1910), 400. ↑ The Encyclopedia Americana (Danbury, CT: Grolier, 1981, ISBN 9780717201129), 215. Bar Hebraeus, Jean Baptiste Abbeloos, and Thomas Joseph Lamy. 1872. Gregorii Barhebraei Chronicon ecclesiasticum quod e codice Musei britannici descriptum conjuncta opera ediderunt, Latinitate donarunt annotationibusque. Lovanii, BE: C. Peeters. ISBN 9780524104040. Bar Hebraeus. 1976. The Laughable Stories. New York, NY: AMS Press. ISBN 9780404113476. Bennett, Clinton. 1998. In Search of Muhammad. London, UK: Cassell. ISBN 9780304337002. Budge, Wallis E. A. 2003. Chronography of Bar Hebraeus. Piscataway, NJ: Gorgias Press. ISBN 9781593330552. Nöldeke, Theodor. 1985. Sketches from Eastern History. London, UK: Darf. ISBN 9781850770657. Sweetman, J.W. 1955. Islam and Christian Theology: A Study of the Interpretation of Theological Ideas in the Two Religions. Part II (in 2 volumes) Vol. I The Medieval Developments Significant for Comparative Study. Historical Survey of the Second Period. Missionary research series, no. 22. London, UK: Lutterworth Press. Takahashi, Hidemi. 2005. Barhebraeus: A Bio-Bibliography. Piscataway, NJ: Gorgias Press. ISBN 1593331487. This page was last modified on 13 November 2008, at 16:13.